The Phoenix Clan is known throughout Rokugan for their skilled shugenja and mastery of elemental magic. The Phoenix are also noted pacifists, preferring diplomacy to war if at all possible. The Phoenix presence in the courts of the land is not great as their courtiers are relatively few, although they are not isolationists like the Dragon Clan. 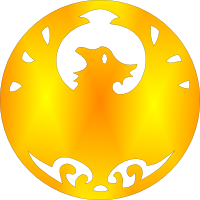 The Phoenix Clan was founded by the Kami Shiba, although the family of his vassal Isawa, generally ran the affairs of the clan. The mystics and philosophers of the Phoenix seek enlightenment, but the clan also seeks to ensure their position as the controllers of magical knowledge within the Empire. With three of the four Phoenix families studying the elements it is hardly surprising they have been widely recognized in this area by the rest of Rokugan. This attitude has a detrimental side in that the other clans often see the the Phoenix as being arrogant and not instead, as having a more intimate knowledge of the kami and their ways. The Phoenix Clan was named the Voice of the Emperor by Toturi III after he decided that the honor should not be the sole province of the Miya family. As such, they are the emperor's peace brokers, seeking to maintain civil dealings between the clans. This role fits naturally with the pacifism of the clan. The leadership of the Phoenix Clan expects the members of the clan to be at least somewhat in touch with the kami and be also knowledgeable in the areas of spellcraft and magical theory. Shugenja are omnipresent in the lands of the Phoenix, and children are raised seeing spellcraft every day of their lives. Magic is the backdrop for all their studies, examinations, and work as children. The Isawa Shugenja school accepts new students at the age of six. When a child reaches this age, the shugenja within or closely connected to his immediate family come together to study the child and determine if he has the ability to receive shugenja training. Among the Isawa family, nearly all children are sent to the school as it is a great dishonor to the child's family otherwise. To the Shiba and Asako families, the testing is merely a chance to determine the child's abilities and destiny, and the schooling is not an obligation but simply a path the child might take. The Phoenix are staunch pacifists. They have been known to intercede on behalf of oppressed minor clans and other daimyo in attempts to stop warfare within Rokugan. The Isawa believe that all life is valuable, from the weakest peasant to the mightiest emperor, and no life should be thrown away. The Asako Inquisitors were founded the third century in response to the corruption of Isawa Akuma by the Council of Five, to combat maho wherever it might arise. For many years they were little more than clan magistrates defending the Phoenix Clan from internal corruption, until the rise of Iuchiban which extended their jurisdiction across the entire Empire. They were officially made a sub-group of the Emerald Magistrates, and would frequently work alongside the Kuni Witch Hunters and also the Jade Magistrates following the revival of that office. After the Battle of Stolen Graves, the Inquisitors became the rivals of the Jade Champion, which the Masters saw as an affront to their control of all things magical. When the title of the Jade Champion was turned into a joke by the Masters, the Inquisitors became a major force in destroying maho, evaluated to Emerald Magistrate status. The Inquisitors answered only to the Council of Five or the Emperor, although they often worked closely with the Kuni Witch Hunters. The goal of the Inquisitors was to find and destroy relics, users, and cells of maho and maho-tsukai. They were brutally efficient and effective in their work, especially given their Imperial mandate. And in matters like these, even the Emperor himself defered to the advice of the Elemental Masters. The Asako family assumed responsibility for overseeing the Inquisitors, as the Asako are often left to their own devices by the rest of the Phoenix. The Inquisitors seek to punish and destroy any instances of maho and corruption, and can be easily identified by a tattoo of a strange eye which they bear upon their palms. The tattoos are magical enhancing their perceptive talents, and were provided by the Togashi family during times when the Phoenix and Dragon Clan were allies. The duty of creating these tattoos was eventually taken over by the Agasha family.